Objective of the feasibility study is to analyse among other things the technical solutions and alternative concepts and to assess the level of risk. For this purpose, it is advisable to consult a specialist. 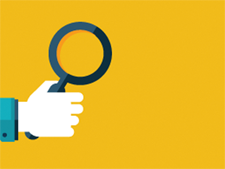 The assessment leads to an overall impression and allows a specific recommendation for a specific concept, which can be further substantiated. Before the decision is made for biogas, the different possibilities of biogas production and utilization should be checked for the conditions set by the farm and possible risks should be assessed. 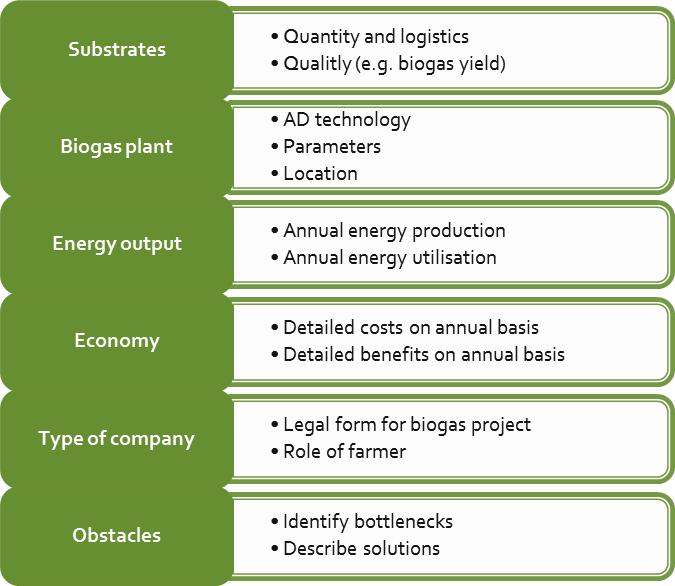 If the farmer wants to go further in his biogas project, he must define his project in a more precise way, analysing the different technical options and details for substrate provision, bioenergy production and utilisation. Additionally, he will study them to know if they are profitable in long-term and environmentally and socially acceptable. With a growing level of project detail and establishment, the opportunities for technical and structural changes decrease. At the same time, the costs are increasing if changes are necessary. Thus, a well-structured and thorough planning is essential for (economically) successfully realizing a biogas plant. For this purpose the farmer may ask a suitable association or a professional biogas consultant to give him support. They will ask the farmer for detailed information on the purpose of his project, his farm (agricultural production, livestock), the surrounding area, etc. They will provide the farmer with technical and practical information and will give him good advices to optimize his biogas project. They will make detailed calculations on the substrate potentials, plant size, energy output and utilization as well as of the demanded yearly costs and yearly income. 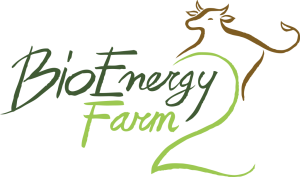 Together with an expert or consultant, the farmer can use the expert calculation tool (offline version available on www.bioenergyfarm.eu) to get further in his biogas project by creating a feasibility assessment. Different project options have to be studied deeply during this step. Those options are all well-described and feasible (profitable and respectful of social/ecological aspects in the long-term). At this time the farmer should be very aware about everything which deals with realizing and running a anaerobic digestion plant – such as the fermentation biology, the substrates, the different types of companies he can create for the plant, how to make a detailed overview on costs and incomes, the required building conditions regarding environmental and social aspects, demands for the plant operation, etc. Starting points for the establishment of an agricultural biogas plant should be among others the available manure and residues on farm, the worthwhile local heat sink and exploitation potential for the digestate. Specifically, it is this necessary to determine the available amount of manure and its properties (like dry matter and organic dry matter content), which are depending on the kind of livestock and the type of animal husbandry (a reference value is 0.15 till 0.2 kW/livestock unit (500 kg live weight)). To determine the amount of manure e.g. agricultural advisory services or technical literature can be used. It should be noted, a single slurry sample often provides only an uncertain value – this applies to the determination of the process flow as well as for the biogas yield determination in the laboratory. In addition, the amount of agricultural residues (such as fodder leftover, Silo topcoats, etc.) and, if available, by-products have to be detected as possible cost-neutral substrates (in temporal and quantitative amount in observance of availability and transport distances). The dimension of the project (plant) is mainly determined from the biogas-production rate of the substrate mix. The standard biogas yield values for each type of biomass used (see Table 1) allows to predict the annual biogas-and methane yield and therefore the energetic capacity of the plant (which is baseline for the economic feasibility of the project). The achievable biogas yield is influenced by the composition and storage of the substrate and by the process technology itself. The storage time of liquid manure before the digestion process for example affects noticeably the biogas potential. Thus, the biogas yield can be reduced after one week of storage by up to about 50%. The estimation of the expected yield of gas, which is necessary for the construction of biogas plants as part of the planning, will be based on individual experience. This leads to very different dimensions of the equipment under otherwise identical initial conditions. Since biogas plants are characterized by high capital requirements and longevity, errors appearing in the system design are often serious, because later correction of design defects is usually not possible. For these reasons, (uniform) standard values for estimating the gas yield of agricultural biogas plants are used on the basis of existing knowledge [KTBL 2015]. The farmer, e. g. together with an expert or consultant, has to quantify and specify the substrates available for the biogas production on the farm. Additionally, substrates available on neighbouring farms will be considered in the quantification if willingness on participation has been announced by other parties. Information is necessary on which substrates are available regularly and which substrates are available seasonally, on transport distances and means as well as on storage facilities. The technical details of the biogas plant need to be specified (e.g. plant concept, size/capacity, compounds, material of the digester, type of gas utilisation (CHP-Unit, boiler, biomethane production etc.) and eventually options for heat utilization. In this context, different technical options/solutions for substrate provision and bioenergy production and utilization have to be elaborated. Additionally, an appropriate location for the biogas plant (including storage, additional rooms or installations, etc.) has to be identified. With increasing plant size and technology, the importance of the right plant location increases. The possibilities for distribution and use of the produced energy are particular important here. It has to be kept in mind that the transport of heat is only economically sensible over a short distance and the transmission of electricity in the low voltage range might also result in a reduction of the economic yield because of significant line losses. For the site search it is relevant, how the distribution of the substrate and the digestate will be realized. Furthermore, it must be determined whether the necessary substrate quantities and qualities on site are available in the longer term. funding (funding opportunities related to the location). The farmer together with the expert or consultant will calculate the yearly amount of electricity, heat or gas resulting from the different solutions identified above. The energy demand of the anaerobic digestion plant as well as the one from the farm incl. associated building and other (external) customers will be identified. Starting points for the establishment of an agricultural biogas plant should be the available manure and residues, the useful utilization of the produced heat and the exploitation potential for the digestate. The decisive aspect in the decision to build a biogas plant is the question of whether the inserted factors capital and labour can be adequately remunerated. In other words, can the proposed biogas plant be operated economically? For the so far identified farm-based (plant) concepts, the total investment costs have to be identified as well as the probable cost of operation including all variable and overhead costs for the whole biogas plant and additional relevant buildings and installations. With the BioEnergy Farm II calculation programme (offline tool available at www.bioenergyfarm.eu) the farmer can, with support of the expert, determine the economic situations of the concepts. The tool comprises information on demanded total investment costs, the upcoming annual costs (also for operation, maintenance capital allowance, replacement investment, personnel, insurance etc.) and yearly income from selling the produced energy. So the farmer will get an overview of the costs and income of the biogas plant on a yearly basis. Additionally, he can match the data with his personal and operative financial situation which is essential for the decision making process. With the help of a balance sheet, an overview on life time basis of the plant and information on the payback period of the project will be given. The combination of biogas production and animal husbandry are clear synergies in terms of economy and often also in terms of work-based economy. It is important that the size of the biogas plant and thus the labour requirement is adapted to the operating conditions of the farm. how can I manage the investment (commitment periods up to e.g. 20 years)? how much time will be required every day for routine inspection/maintenance work? is this workload compatible with the situation on my farm (do I need extra staff)? what working time model is possible for my family (e.g. who will take over the farm after me)? Although the economic analysis of the feasibility study on an economically promising result comes, it is necessary to continue to question the economics of the project critical. If a lack of profitability emerges, nevertheless the possibility of terminating the project should be taken into consideration. The expert will help the farmer (and possible partners) to evaluate the pros and cons of the different types of companies and to decide for the best options. Additionally, the farmer and the expert will evaluate the impact of the different biogas solutions on the farmer’s current activities. All parts of the process are necessary for operation, but they can be linked to very different labour requirements depending on the mode of operation and substrate. The work schedule must be included in the considerations to avoid surprises at the stage of pre-planning in any case [FNR 2013]. Before starting to operate an anaerobic digestion plant, it is advisable that operators and staff will have a certain qualification to run a plant, so that they have basic knowledge about the biological process (helpful for trouble shooting). The qualifying measure raises also the awareness of the operator for potential hazards on site and helps to safely operate the plant (professional cooperatives and some insurance companies require this for the system operation). For successfully realizing a biogas project bottlenecks have to be identified in an early projects stage and solutions have to be discussed. In this context, it is helpful to meet the local authorities in an early project stage to check if it is realistic to build a biogas plant in the chosen area etc. Moreover, it is necessary to evaluate the risks of each possible biogas concept, i.e. the effects of lower plant availability, higher yearly costs, lower income, spare parts availability, emission and noise sources, occurring problems with the neighbourhood, logistics, grid connection etc.